Kaethe Weingarten is the founder and director of The Witnessing Project, a non-profit organization that consults to individuals, families, and communities locally, nationally, and internationally ‘to transform toxic witnessing of violence and violation to active compassionate witnessing with others.’ She supervises at the Victims of Violence Program at Cambridge Health Alliance and worked extensively in Kosovo and South Africa. 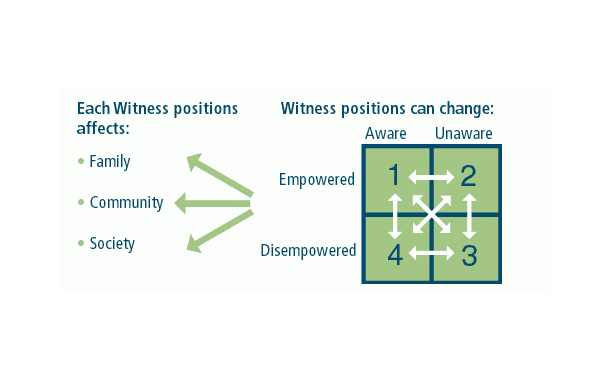 The Witnessing Project has two primary goals: to make people aware of the themselves as everyday witnesses to violence, and provide people with the tools to cope with the biological, psychological and societal effects of witnessing. This is achieved through a variety of ways, tailored to the particular situation. In every case though, the work teaches skills to carry out safe, effective, and positive witnessing practices in the context of family and community involvement. Ceremony, ritual, the arts and nature often play a role.